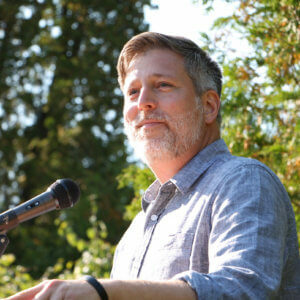 Matthew Derr is President of Sterling College in Vermont. A community organizer, teacher, fundraiser, and strategic planner, he was inaugurated in 2012 as the eleventh president of Sterling College. At Sterling, Derr led the effort to divest the Sterling endowment from fossil fuels and become only the third college in the United States to do so. He led the effort to divest the Sterling endowment from fossil fuels, founded the Fried Center for Sustainable Agriculture & Food Systems, and recently launched an effort with The Berry Center to expand the reach of farmer education. Derr is nationally recognized in higher education for his expertise in leading institutional change and for strengthening mission-based focus. In 2011, he was awarded Chief Executive of the Year by the Council for Advancement and Support of Education (CASE). Prior to Sterling, Matthew Derr served as Interim President of Antioch College, where, he developed a concept for a new curriculum focused on issues related to environmental stewardship, inspired by Sterling. Unusually for a college president, he also fulfills a role as a faculty member and teaches community organizing.